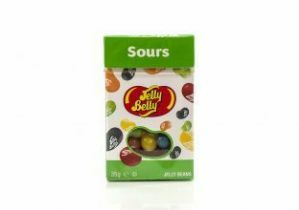 Jelly Belly Jelly Bean Sours Mix 35g. A collection of Jelly Belly's Original favourite fruit flavoured Gourmet Jelly Beans soured! A collection of 20 flavours of Gourmet Jelly Belly Jelly Beans. A collection of 5 flavours of Gourmet Jelly Beans.